Boss Bass' are possibly related to the identical-looking Big Bertha. The Big Berthas are a sub-species of Cheep-Cheep that live deep in the sea. 7 Split the comic character? The image is probably a Big Bertha. Hello, I'm Time Turner. This brings up a question: are Big Bertha and Boss Bass the same enemy? Hello, I'm Time Turner. What actual differences do these have? They have the same Japanese name, look exactly the same with literally no differences whatsoever (even having the same sprite in their original appearance), their only major differences are behavior and gender, and that's not even consistent anymore. At this point it's basically "Big Berthas always spit Baby Cheeps, except when they don't, and Boss Bass are always male, except when they aren't", and it's a confusing, jumbled mess, just look at how many examples aren't even sure which is which. Different colored Koopa Troopas have more differences than them, as do Super Mario Bros. 2 Pokeys compared to modern ones, but those aren't considered seperate species by most people. Deadline: April 6, 2015, 23:59 GMT. Binarystep (talk) Per my reasons stated above. SmokedChili (talk) In Super Mario Sunshine, there are two (well, three) kinds of Cheep Cheeps that have different behaviors; the orange ones and the fiery ones jump and swim, while the pink ones try to drag Mario further to the depths. They are all known as Cheep Cheeps without any unique words or alternative letters to make them different species. In Japan, this is the same with Boss Bass and Big Bertha, but the English SMB3 guide gave them unique names, and that's very likely unreliable localization. So really, how would merging these two be any different from having two enemies with different behavior (and appearance) on the same article when they are universally considered the same enemies? LinkTheLefty (talk) As seen in the comments, it can be concluded with current knowledge that they are intended to be the same enemy species. 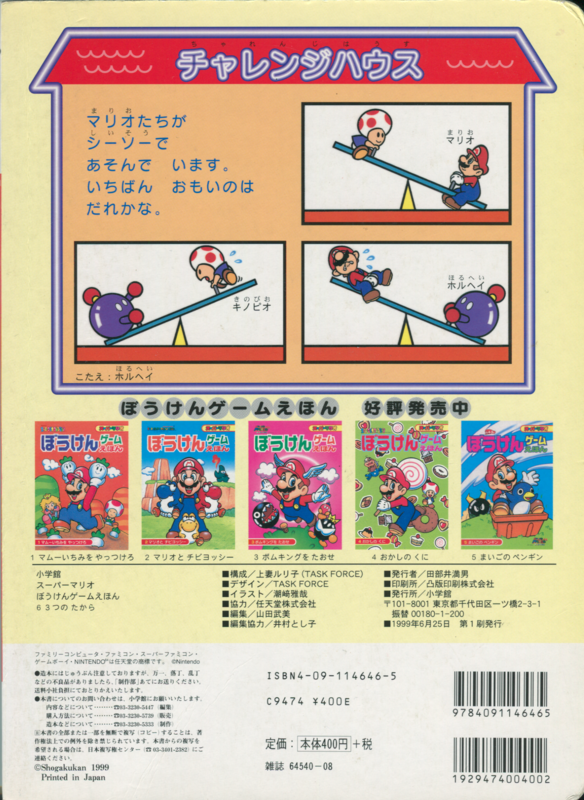 We definitely know (not just from hearsay, but some physical scans to back this up) that the original Japanese guides do not distinguish between the two, and there are multiple licensed Japanese guidebook publications versus one single Nintendo Power player's guide. The mouth-brooding variant of the enemy has only directly appeared in Super Mario Bros. 3, and their last mention so far (and it seems only in-game reference) was in Super Paper Mario; therefore, it makes sense to place them in the same article and consider it Boss Bass unless specifically named otherwise. As for the Nintendo Comics System appearance of "Big Bertha" - it can be observed that she is an individual character named Bertha, so it makes the most sense to give her a separate "Bertha (Nintendo Comics System)" page to compensate. LudwigVon (talk) They have maybe different gender, but their attack are different, so I oppose to this. SuperYoshiBros (talk) The fact that both Boss Bass and Big Bertha appear in the SAME GAME to me is a good enough reason to keep them split. Andymii (talk) While this proposal makes more sense than the other merge proposals, SuperYoshiBros makes a good point- they would obviously be different characters if they both appear in the same game. And yes, their attack pattern is different. Toadbrigade5 (talk) Different Attack Pattern warrents a seperate page. Stated to be different warrants a seperate page. Appeared seperately in same game with different official name warrants seperate page. Done, I'm out. Walkazo (talk) - Like I said in the comments, the SMB3 and comic appearances of Big Bertha should be kept separate, but all the ambiguous stuff about big, non-mouth-brooding fish should go to Boss Bass (including the SM64DS appearance unless we can verify the "Big Bertha" name, but I doubt we will), and the "or possibly Big Bertha" stuff should be scrubbed from the wiki. Marshal Dan Troop (talk) Per Walkazo. Burningdragon25 (talk) That is a per all! Time Turner (talk) Per all. How are these seperate enemies despite only being different species in ONE game, and only according to the English localization, which has been incorrect several times in the past? How is a translation from 25 years ago still relevant even though it was inconsistent with several names already (see: Kuribo's/Goomba's Shoe)? How are these seperate enemies despite not having ANY differences in their recent appearances (like in Super Mario 64 DS where Big Berthas are actively aggressive and don't spit out Baby Cheeps, or in Yoshi's Island DS where a female Boss Bass appears)? How are these seperate enemies when every post-SMB3 example doesn't even know which is which, and starts with phrases like "A Big Bertha (or maybe a Boss Bass) appears in [game]"? How does a different attack pattern mean anything considering that REGULAR Cheep Cheeps have differing attack patterns depending on whether you're near or in the water (being more aggressive and jumping out and being more passive and swimming around, respectively (which is almost exactly like Big Berthas/Boss Bass))? And here's another, different guide. Featuring Big Bertha as 巨大プクプク. So its Japanese name is indeed the same as Boss Bass'. A Brick Block, sometimes simply known as a Brick, is a block that has made an appearance in nearly every Mario platformer to date. As its name implies, Brick Blocks are blocks made of bricks. A Brick Block, sometimes simply known as a Brick, is an object that has made an appearance in nearly every Mario platformer to date. Contrary to their name, Brick Blocks are not actually bricks, being Toads Bowser cast a spell on. And while someone may say "They haven't been confirmed to be the same", that brings me to my next point, so far, two Japanese guides have been found saying they're the same, as opposed to one English localization, and a comic likely based on said localization. Next question, why are we considering them different species when their only differences (Boss Bass always being male, Big Berthas spitting out Baby Cheeps) haven't appeared in more recent games according to the article? One of those guides also lists Buzzy Beetles and Para-Beetles, Bloopers and Blooper Nannies, Hammer Bros. and Sledge Bros., Fire Chomps and Chain Chomps, and so on and so forth, and we consider all of them separate. What's your point? Hello, I'm Time Turner. You're distancing yourself from the original point. I was just pointing out the fallacy. Hello, I'm Time Turner. "They have different attack patterns (one's actively hostile and jumps out of the water, and the other just passively swims and spits Baby Cheeps)!" It's not impossible for one enemy to have multiple attack patterns depending on their environment; in fact, with the exception of spitting Baby Cheeps, the Big Bertha/Boss Bass behavioral difference is exactly the same as surface/underwater Cheep Cheeps in SMB3 (and likely intended to mirror that). "The "Big Bertha" name was also referenced in the official comics, adding proof they're supposed to be different species!" The official comics were clearly just using the only English name at the time, so we shouldn't count them as "more evidence" one way or the other. And besides, it was just a character named "Bertha", they never even referred to the species directly to my knowledge. "The Japanese name doesn't prove anything!" On its own, it shouldn't be used as the only proof, but considering they also look exactly the same with literally no differences whatsoever, and our only proof they're different is an inconsistent guide, we should probably take a closer look at this issue. "We shouldn't disregard the English names!" We also shouldn't treat the (old and usually inconsistent) English localizations as being perfect because of nostalgia. 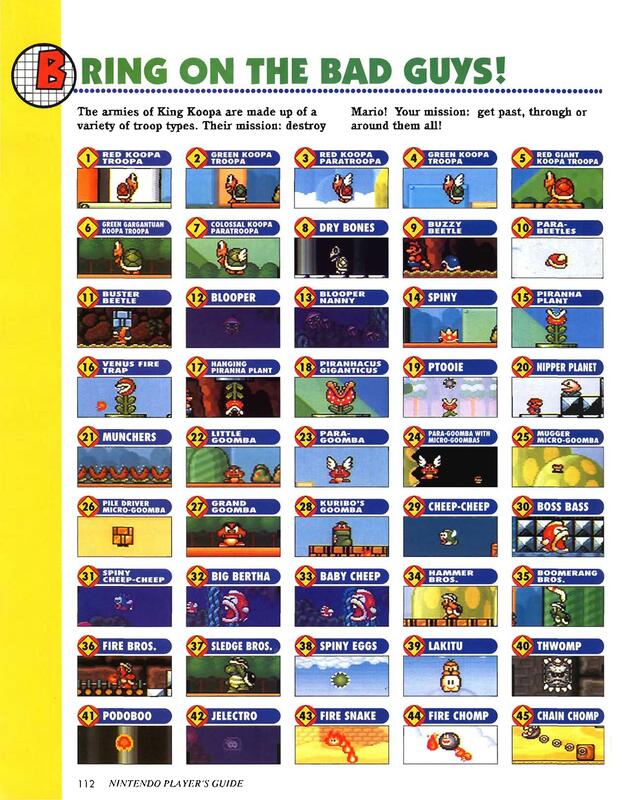 Consider how this guide lists "Hanging Piranha Plants" as their own species, or how most NES-era guides and manuals called red/green Koopas different enemies, or how the SMB manual made up a "Mushroom King" from nothing. Localizers make mistakes, this is likely one. That doesn't make them different species. Especially since it's not always true. "What name would the final article have?" The most recent name as per policy, which seems to be Boss Bass. "They both appeared in the same game!" And my entire point is that it's not "two things in the same game" but most likely "one thing incorrectly called two things in a guide". "Nintendo never said they're the same thing!" In English? No. But they did in two Japanese guides, as opposed to one shaky English guide. I think I've made my point better this time around. SmokedChili (talk) As usual, I follow my stance that enemies with the same original source material name can adapt different appearances and behaviour, in one game or not. And then there are the localizations that are/may be still used even though they are unreliable and erroneous in context (see NoE still calling the Koopalings "Bowser's Minions"). Since the source material in this case is Japanese, per proposal. If the source language was English, then I wouldn't support this. Tails777 (talk) Regardless, I still find the whole appearing in the same game thing to be a seller point for keeping them split. They also have subtle differences, such as Big Bertha spitting out Cheep-Cheeps, to which Boss Bass doesn't (unless I'm mistaken). In short, I still think the previous opposing votes made stronger points so per them. PowerKamek (talk) I'm sorry. This proposal was done before and it lost. Plus, they are totally different. They may be the same spiecies but not the same character so I don't see why you want them merged. We always have different articles on related spiecies, or just spiecies of stuff. If they are very identical, then I have no problem with them being merged. LudwigVon (talk) Per both. Why are you making this proposal again? I thought The first one resolve the problem. SuperYoshiBros (talk) "the Big Bertha/Boss Bass behavioral difference is exactly the same as surface/underwater Cheep Cheeps in SMB3" is false. Boss Bass jumps out of the water and tries to chase you, Big Bertha just swims back and forth and spits out Cheep-Cheeps. Not sure if Big Bertha still kills you no matter what power-up though, mostly because I don't feel like testing it out... Anyway, I still believe that Boss Bass and Big Bertha are separate enemies. Walkazo (talk) - Per all, per all the opposition votes and comments in the last proposal as well, and per SuperYoshiBros's sentiments in the comments here about repeat proposals getting tiresome. Bazooka Mario (talk) I've looked at both sides of the argument, and I think that the two are better left different. It's the fine the way it is, so I think merging Boss Bass with Big Bertha would be speculation, with its strongest point being "well, enemies can have different attack patterns". TheHelper100 (talk) - Per all, also Big Bertha is a female and Boss Bass is a male. Lumastar (talk) - Per all. This proposal's only justice is that it will show that the general opinion on this subject has not changed. Also, as Walkazo said in another proposal it would be odd for us to not have a dedicated article for one of these. Speaking of which, what name would we even merge them under? Marshal Dan Troop (talk) Per SuperYoshiBros. I mean they are'nt the same. I crossed the confusing parts out. Sorry to confuse you. But no, I'm not referring to that. "No proposal can overturn the decision of a previous proposal that is less than 4 weeks (28 days) old." "All rules for Talk Page Proposals are the same as mainspace proposals[...]"
Even if it's allowed, I'm not sure if it should be done. It's like with the Parabuzzies; we have all of the same information that we had previously, so people are going to make the same arguments and the same rebuttals to those arguments, and people's opinions are unlikely to change, especially to the point where the verdict is flipped. It just seems like it's an unnecessary process. Hello, I'm Time Turner. Coming off of our last two proposals, we're left in an awkward place. The things in Yoshi's Island DS that look and act like these and are named in English are grouped with Cheep Chomp, due to them having the same Japanese name, plus the fact that the red fish in 64DS and Kart DS used the same model as the purple fish in NSMB. We don't know whether Bakubaku in Super Mario 64 was intended to be the same as Kyodai Pukupuku. It may be the same thing, but renamed, as Kyodai Pukupuku wouldn't work as a name when it's only as Kyodai as regular Pukupuku. Alternatively, it could be intended as a different stand-in for the same reasons. 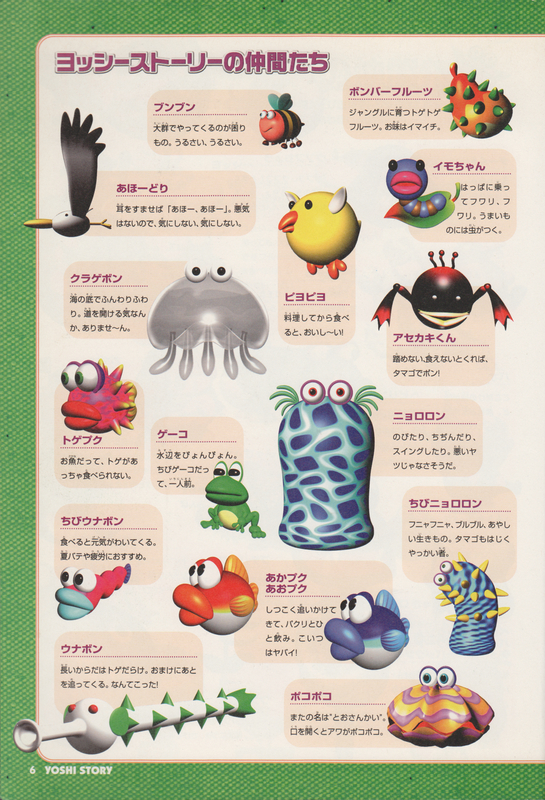 The Super Mario Pia guidebook considers them different enough to not mention SMB3 in Bakubaku's section, but it also considers the Super Mario Land 2, Super Mario Galaxy, and Super Mario Galaxy 2 depictions of Spiny Cheep Cheep to be different from the rest, as is the only Japanese guidebook ever to say that the walking bombs from Super Mario USA and Super Mario Sunshine are both the same as the Bob-ombs in other games. In most cases, Japanese guidebooks are extremely rigid about following specific names, anyways. 64DS gave them a very deliberate redesign to hark back to Kyodai Pukupuku, giving them the "squint" pupils while removing the shades. People in the last proposal mentioned the flat, non-hair/wing-like dorsal and pectoral fin of Kyodai Pukupuku in comparison to Bakubaku. However, as I work with SMB3 sprites as a hobby (li'l self-advertisement), I can say that the in-game graphics for the regular Cheep Cheep in that game resembled that as well. Most of the large enemies in that game were rather crude scaling-up of their smaller counterparts' in-game appearances, with the face being different in this case (though admittedly, the original NES sprites fail to give the large one a light-colored belly). Additionally, both artworks seem to have been drawn based off of the sprite, not vice-versa (though both give them a light belly), and the game's artwork for Spiny Cheep Cheep from the game's own manual depicts similar pectoral fins as well. Basically, the miscellaneous attributes of both Kyodai Pukupuku and Bakubaku are dependent on those of the regular Cheep Cheeps in their respective games. Furthermore, the first usage of the term Bakubaku had perfectly flat, red fins, just like the game's Pukupuku, meaning that once again, it's tied to the design of Cheep Cheep. Following 64DS, later games started using that design. Kart DS actually used a Bakubaku to replace what was formerly a giant Pukupuku. Make of this what you will. 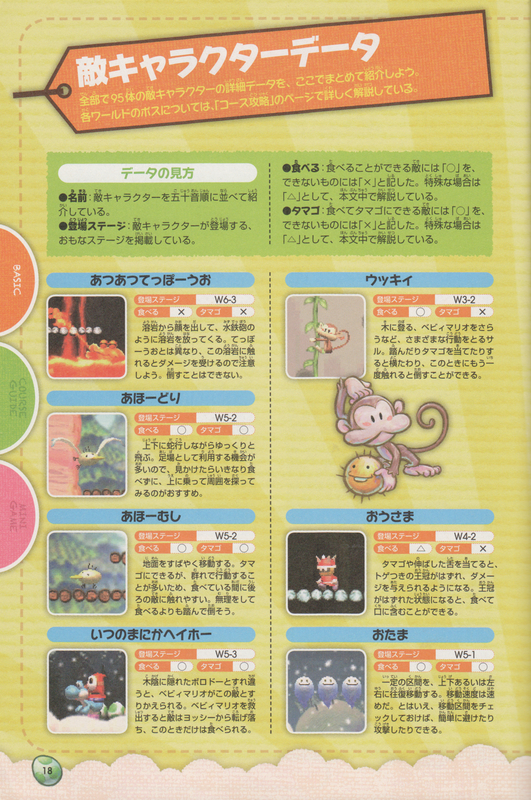 YIDS continued with the SMB3-inspired design, even using behavior taken directly from Kyodai Pukupuku, and the English version outright calling it Boss Bass through a boss's English name, as well as in guides. In this game, its jumping behavior also makes it a large counterpart to the game's own Cheep Cheeps, which of course take after the "Flopsy Fish"-named ones from SMW2 right down to just reshading their graphics (because Artoon was lazy). The NSMB Bakubaku used the same behavior, model, and noises as the 64DS one, but changed its colors to purple and turquoise, in order to keep it from being confused with the new big Cheep Cheep counterpart, Dai/Deka Pukupuku, which is definitely a different thing from Kyodai Pukupuku. However, we consider Kyodai Kuribō and Deka Kuribō to be the same thing, as is the case with the large Nokonoko, Pakkun Flower, and Teresa, all of which went through varying amounts of Japanese identifiers, particularly the last one. Anyways, the nonaggressive large counterpart from NSMB and onward indicates that the voracious large Pukupuku that was its former large counterpart is no longer its large counterpart. Due to using the behavior from 64DS, the underwater Bakubaku in NSMB is much more aggressive than the underwater Kyodai Pukupuku in SMB3. 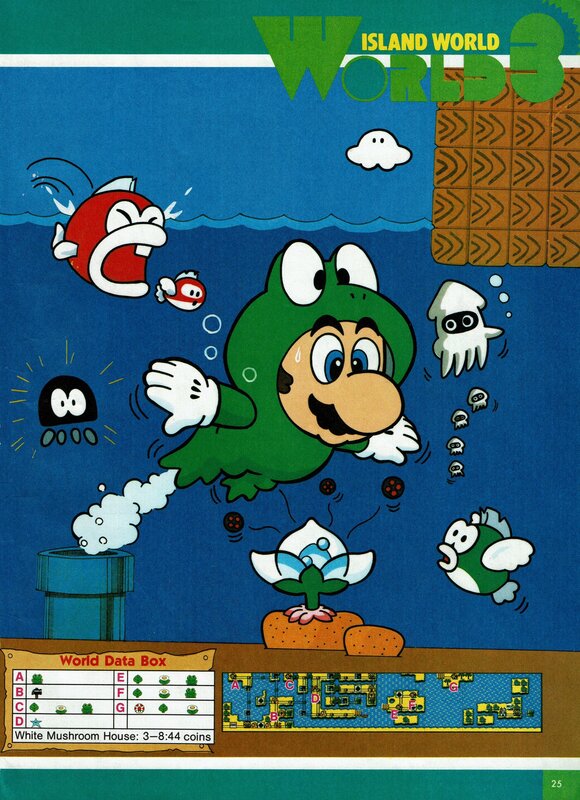 However, the underwater Kyodai Pukupuku in SMB3 was likely intended to be an enlargement of the passive green Cheep Cheeps of the game, as they both swim back-and-forth, with the Baby Cheep acting as an added hindrance. The jumping Cheep Cheeps in that game are obviously more aggressive than that, and the jumping Kyodai Pukupuku takes after that, with the eating being the added hindrance. There are no jumping enemy fish in Super Mario 64 whatsoever. Therefore, any fish that was to eat as an attack would have to do so while swimming. Even if the original Bakubaku was not intended to be the same as Kyodai Pukupuku at the time (which we don't know either way), the remake's design indicates that they now are, at least retroactively, in a similar case to Ukiki, which if so, makes it a case of convergent design evolution. Therefore, what is really unknown is whether they are convergent or always had been the same. As YIDS makes it pretty clear that they're the same now. As such, the decision to be made is whether this potential convergence should be covered on the same page, like Ukiki's potential convergence is, or left separate. The existence of a further giant Cheep Cheep counterpart that jumps and eats like the ones in SMB3 and YIDS and is dependent on its game's own Cheep Cheep design (a game which also features a weird-looking Spiny Cheep Cheep) is noted, but until more concrete evidence either way shows up, I'm not planning on touching that issue in relation to this. Particularly with the ambiguous appearance in Mario Golf, as that technically could have been a regular Cheep-Cheep. Additionally, in the ultimate twist, there is a Kyodai Bakubaku in Mario Party 10. Which itself should probably be split like most other "Mega"s, but that's for another day. Anyways, if successful, this proposal will merge the recently-merged Boss Bass and Big Bertha with the recently-expanded-through-section-merging Cheep Chomp, with the page taking the latter name. Please take a look at the current state of both pages before voting, as they are vastly different than they were two months ago. Additionally, if this proposal fails, the only logical thing to do will be to reexamine Ukiki's article for consistency with how this system would thus work, as they are one of the only other enemies to have a comparable and extensive history, between the SMW2 and SM64 monkeys. LinkTheLefty (talk) Super Mario Pia is the only real factor against this merge, but given that it also does not mention Kyodai Pukupuku at all and additionally does not even cover the games where Bakubaku had the transitional red fish design (namely Super Mario 64 DS, Mario Kart DS, and Yoshi's Island DS), the evidence far outweighs it. Per proposal. FanOfYoshi (talk) Per Toadette the Achiever's comments and Waluigi Time's comments. Toadette the Achiever (talk) Per my comment below. Waluigi Time (talk) This doesn't sit well with me. Per Toadette and the previous attempt to merge these. I still believe Cheep Chomp was a replacement for Boss Bass, and not a redesign. I'm also not a fan of the way the two have been handled recently (This looks like a Boss Bass but is actually a Cheep Chomp because the Japanese name says so). I do digress that Bass's SM64DS behavior is much closer to Cheep Chomps, though I think the difference between 2D and 3D platformers accounts for that. Chester Alan Arthur (talk) Save the fish! Per all. I'm not fully sure about this: Super Mario Advance 4 was released after Super Mario 64 and yet the term Kyodai Pukupuku was used in its Nintendo Official Guidebook, while on the other hand since Super Mario 64 DS the term used for the fish that looked like a Kyodai Pukupuku was clearly Bakukbaku. When looking at the files, Super Mario 64 DS has a data\data\enemy\bakubaku directory with three files starting with bakubaku (bakubaku.bmd, bakubaku_attack.bca and bakubaku_swim.bca); Yoshi's Island DS has four sound files named SE_BIG_BAKBAK_GO_UP, SE_BIG_BAKBAK_DIVE, BANK_BIG_BAKBAK_GO_UP, BANK_BIG_BAKBAK_DIVE; as far as Mario Kart DS is concerned, we have the data\data\Course\old_hyudoro_64\MapObj directory with two files: baku_shadow.nsbmd and bakubaku.nsbmd. Essentially, even in the first iterations where it looked like a Boss Bass, there was hardly a connection with Kyodai Pukupuku in the name of the files. @LinkTheLefty "I do want to figure out if the Japanese version of Super Paper Mario has a reference to Kyodai Pukupuku or Bakubaku"
This page was last edited on January 2, 2019, at 14:14.